Stainless steel gear pumps in the chemical industry in the role of stainless steel gear pump plays a very important role in the chemical industry, which is similar to the human heart, acts as the oil pump, stainless steel gear pump can not be started if the whole system will stop using , delay production. 1. KCB stainless steel gear pump mainly consists of gear, shaft, pump body, safety valve and shaft end seal. 2. The gears have high hardness and strength after heat treatment and are installed in the replaceable bushings together with the shaft. The lubrication of all parts in the pump is automatically achieved using the output medium while the pump is operating. 3, the pump has a reasonable design of the drain and return tank, is the torque of the gear in the work of the small, so the bearing load is small, small wear and high pump efficiency. 4. 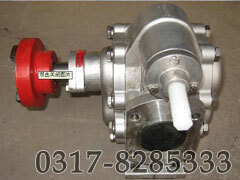 The pump is equipped with a safety valve as overload protection. The total return pressure of the safety valve is 1.5 times the rated pressure of the pump. It can also be adjusted according to actual needs within the allowable discharge pressure range. However, note that this safety valve cannot be used for long-term operation of the pressure relief valve. If necessary, it can be installed separately on the pipeline. 5. See the pump from the extended end of the main shaft for clockwise rotation. Stainless steel gear pump installation in the chemical industry: Due to the corrosion resistance, long service life, light weight, safety and health of stainless steel pipeline pump, it has been favored by the majority of users. And the cost is higher than the ordinary pump. The used stainless steel material is a green material and can be recycled 100%. In casting, stainless steel pipeline pumps have been widely used in the market in recent years. Especially in recent years, higher requirements have been put forward for the food industry. Stainless steel materials are used for medical purposes because of their safety and health. The food grade uses medical stainless steel. The stainless steel gear pump is the representative material for fluids in the chemical industry.